When you’ve been away from the Rocky Mountains, it’s easy to feel homesick. Colorado’s beauty is absolutely breathtaking and if you’re looking to send a taste of home to someone who may be away at college, working abroad, or completely relocated, Bisket Baskets wants to make it easy to send Colorado’s best. Bisket Baskets is proud to be a Colorado-based business (shout out to our hometown of Parker, CO!) and our gourmet food gift baskets are enjoyed around the country as the perfect gift for all occasions. Our collection of Colorado gift baskets are no exception. Perfect for birthdays, housewarmings, or just because, Colorado gift baskets are an amazing way to send a piece of home to someone you care about. All of our Colorado gift baskets showcase incredible gourmet foods that range from the sweet to the savory, so there’s something for every taste. Crunchy, chocolatey, spicy – you name the preference and we have a gift to fit! Plus, there are a variety of styles and sizes of gift to choose from. Send a Colorado Care Package to a student away at college or a more grand display to an entire family with our Rocky Mountain Majesty Gift Basket. No matter which Colorado gift basket you choose, you can’t go wrong! Send a taste of home to someone you love from Colorado with a little help from Bisket Baskets. Our gourmet gift baskets highlighting the best of the Rocky Mountains will bring cheer, no matter the distance! 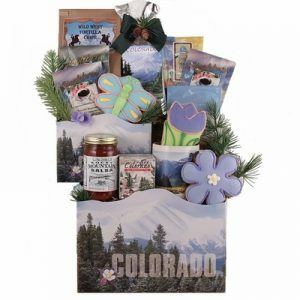 Shop all Colorado Gift Baskets today at BisketBaskets.com.